Sitting staring out of my window at sullen grey cloud and the branches of the ash tree in the garden whipping backwards and forwards, it is difficult to recall the delightful conditions we experienced during April. In this part of the world the last week in April is a critical one for photographing small woodland birds. Most of the migrants will have arrived but the leaves are not fully open, meaning that those birds are still visible. 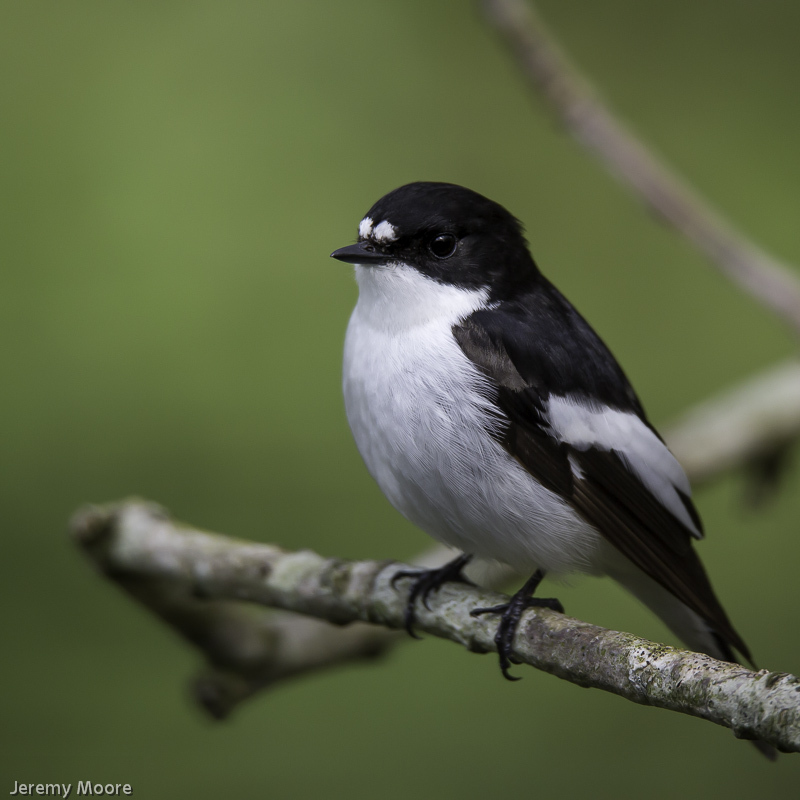 During several visits to Ynyshir RSPB reserve during late April there’s no doubt that the most prominent of those attractive summer visitors was the pied flycatcher. I spent many hours with two males which were both energetically defending small territories around their chosen nest-boxes. For hour after hour they flew from bare twig to bare twig and uttered their simple sweet song. When you see the determination with which they do this it is worth remembering that each bird had probably completed its journey from Africa only a day or two – or possibly just hours – previously. And not only that, but it is quite likely to have been the same nest box they had used last year. By the time of my last visit one bird had attracted a female – again possibly his mate from last year – and they were visiting the box together. Who knows what they got up to in there! (discussing the colour scheme, I should think…..). By that time he was also noticeably less inclined to sing. Who’s a pretty boy, then……. One bird was easily visible from the Ynyshir hide, which in theory should have made photography easier. But a constant stream of other human visitors to the hide was a distraction for both bird and photographer. How dare they! The other bird was quite approachable out in the open. Over a period of a couple of days altogether I came back with hundreds of pied flycatcher images, many almost identical, and it has been quite an ordeal processing and sifting through them. It was easy to pick out one classic bird portrait, but as far as “pied flycatcher in the landscape” goes I still haven’t come up with an absolute favourite. The birds’ surroundings were usually a jumble of oak twigs and branches, some in focus and some out, with a few leaves, but little regular structure. In any event I plan eventually to show three images together so (in theory) that should make life a little easier when the time comes to make final decisions. The other birds I had hoped to photograph were redstart and wood warbler. The former was present but difficult to get to grips with; I’ve never found Ynyshir to be the best of places to connect with this species. The latter just hadn’t arrived by the end of the month. Oddly, if one left the reserve and went a short distance inland several wood warblers were holding forth in tall beech trees on the side of the Einion valley. They were impossible to photograph, however, so I wonder if the Ynyshir birds are back yet. And I wonder if this awful weather will relent for a while before I leave for the Camargue on Tuesday? This entry was posted in Uncategorized and tagged bird photography, pied flycatcher, rspb ynyshir, tamron 150 - 600 zoom lens. Bookmark the permalink. 1 Response to Who’s a pretty boy, then? pretty boy indeed! Nice shot. Have fun in the Camargue.